The Tribune Tower is a neo-Gothic building located at 435 North Michigan Avenue in Chicago, Illinois. 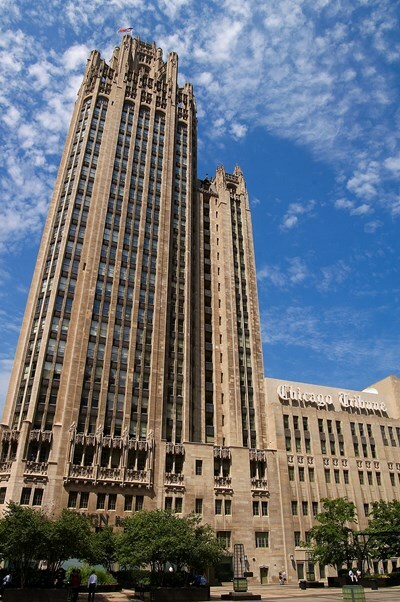 It is the home of the Chicago Tribune and Tribune Company. WGN Radio (720 kHz) also broadcasts from the building, with ground-level studios overlooking nearby Pioneer Court and Michigan Avenue. CNN's Chicago bureau is located in the building. It is listed as a Chicago Landmark and is a contributing property to the Michigan–Wacker Historic District. This description uses material from the Wikipedia article on Tribune Tower and is licensed under the Creative Commons Attribution-ShareAlike License (view authors).